Dark Star sound; could it be had from this Pickup? Discussion in 'Pickups & Electronics [BG]' started by seang15, Aug 14, 2012. Does the Fender TEB101B 4-pole humbucker resemble the Dark Star? Poll closed Aug 19, 2012. I know, I know...those of you that already have these pups, will say "No way on God's Green Earth can you get the DS sound from anything but DarkStar." Or something similar. Everything I have heard on YT and other sources of the two pups just strikes me as similar. Note that, I am "fairly" new to enjoying this kind of tone; long-time (LONG TIME) jazz pup lover here. And that hasn't changed But my motherbucker in my ATK is making me look at different pups and offerings (MM, soapbars, etc.). And these pups listed here as well do strike my fancy. Thanks in advance for any info, debates, heated arguments, threats, defamation lawsuits, etc. That's not made anything like a Hagstrom Bi-Sonic (Or DarkStar). Bi-Sonics are fairly under wound single coils (about 6K). 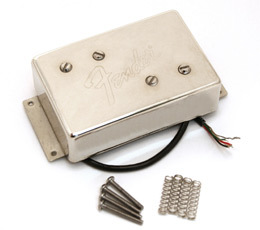 That Fender pickup is a humbucker and will a lot darker sounding than a Bi-Sonic. Sorry dude, I laughed out loud a little at that. No offense, it's just that they are entirely different animals. That Fender Mudbucker will sound nothing like the Bi-sonic or its descendants. Ever heard the old Gibson humbuckers? Like Jack Bruce, Andy Fraser? It will be way more similar to that. If I recall the Fenders are a little more focused, but still, high output, dark, and fat sounding. The Bi-Sonic is a very open, wide-spectrum pickup, fairly clear across most of the frequency range. Now, I'm not saying the Fender TEB101B is a bad pickup, it just does its thing, and the Bi-Sonic does its thing, and both of them are very different from each other. I think you have a misconception here, what is called "hearing with the eyes". Surely the DS looks like a big pickup, similar in size to a mudbucker, but it isn't a mudbucker. that fender 4-pole isn't a mudbucker, either. it's a split P-style pickup under a chrome cover. The REAL LA -- Lower Alabama! I've got a Darkstar in a Mexican P-Bass and a DPLEII, and when I unplug my active Lakland Jerry Scheff 5 and plug in either Darkstar bass, there is not much difference in output at all. I don't have to flip the input level switch on any amp that I've used. That has always amazed me about the Darkstar basses, that they are almost as hot as an active bass. Not sure I've ever seen a poll on TB as one-sided as this one. I'm trying to figure out who voted yes. There's really no reason to presume that a preamp will automatically result in greater output. I would venture a guess that a company like Lakland would specifically set up the pickups preamp to keep an average output. Edit: but he's feeling MUCH better now, folks. Thanks for the help!! DS are single coil also. do not let the size fool you. really looks like a sort of p90 with extra parts just to raise and lower the magnets. I voted yes just because of this post. You bastige! You are tampering with the scientific accuracy of a TalkBass poll! How can this not result in utter chaos? I only hope you can live with the guilt. dangit now i want one! Indeed. When my luthier installed my Dagstar, he commented on how similar the pickup is to P-90s. Here is the Dagstar (Mini version), which is essentially a stripped down Bi-Sonic without the fancy pole adjustment mechanism. You can see that the actual size of the pickup is much less than a larger humbucker.